I’ve realized that recently I have not been feeling really enthusiastic about working on the new setting and looking forward to seeing it in action. The last really cool thing where the 50 Cool Things two weeks ago. I think I found out why that is and how to fix that. 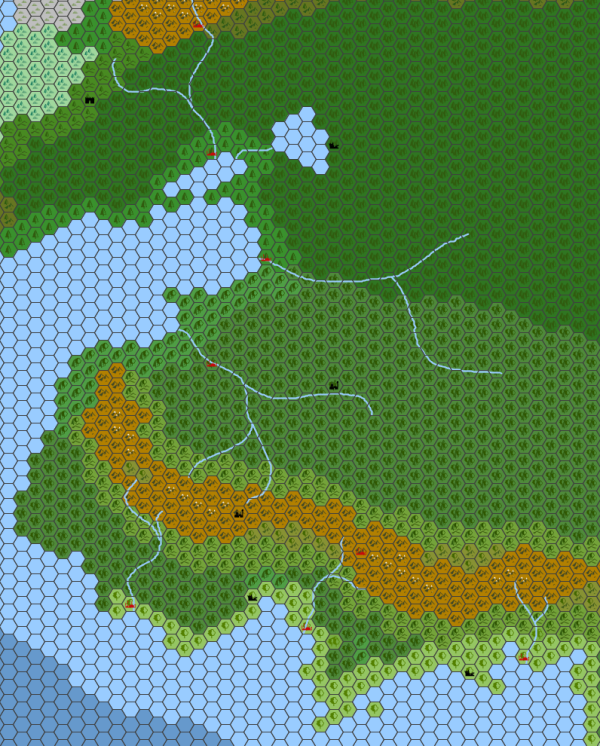 The first thing is that I took the idea of using a lot of elements from medieval Northeast Europe and it turned into something more like taking medieval Northwest Europe and adding fantasy elements to it. While I am a huge fan of The Witcher and Dark Souls, the medieval design isn’t really one of the things I love about them. The style that I really love is that of Planescape, Dark Sun, Morrowind, Star Wars, and evrything deawn by Moebius. Worlds that feel very alien and often somewhat surreal. Worlds that are more about representing ideals instead of realism. The other thing is that I’m not really a fan of treasure hunting. What I really love is exploring magical places, but the material stuff you carry out of them doesn’t do much for me. It’s just such a central element in Sword & Sorcery and wuxia and a standard assumption in most RPGs, but the whole point of starting a new setting was to make something suited for more noir-style stories and adventures. Changing from gold to artifacts didn’t really do the trick. With that in mind, I think I want to take the setting into a more alien and high magic direction instead of making it Earth-like and low magic. This mostly doesn’t actually change the things that I’ve already described here. The map remains the same, the people remain the same, and the factions remain the same. The magic system of priests, witches, and sorcerers and magical knowledge leading to loss of humanity probably will also remain the same. I will also stick to my plan on using Baltic, Finnish, Mongol, and Greek sounding names and have the trade networks be modeled after the Baltic Sea. And of course, it remains a temperate to cold region of forests with lots of swamps and heaths, full with dangerous and powerful spirits. What changes will probably be the nature of the eldritch wilderness and also of the civilized lands. 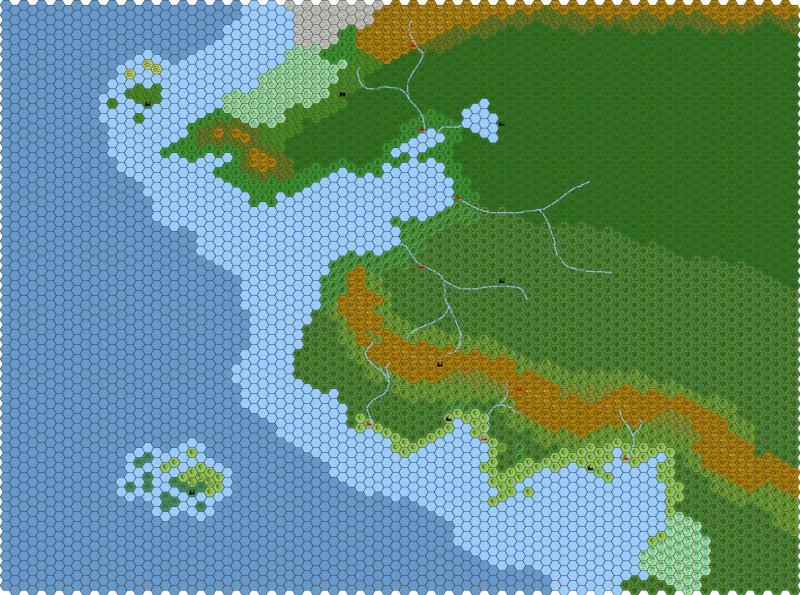 So far I had been working with the concept of Corelands, Borderlands, and the Weird, based on the assumption of a very medieval Earth-like setting. But it doesn’t make much sense in an alien high magic world. Instead, I found some good guidance looking back into the introduction of the Planescape setting. Planescape is also about exploring wonderous places and collecting valuable stuff there, but it is meant to be so much more than a dungeon crawl treasure hunt. In Planescape, things are intended to get a much deeper meaning and provide more complex motivations by relying on the central theme that belief changes the environment. The factions have their ideological conflicts because each of them tries to make the universe work the way they think it should work and the only reason it doesn’t is because other people still believe that it works differently. This reminded me of my earlier but then discarded idea of powerful immortal sorcerer kings using their supernatural powers to create areas within the otherwise chaotic and dangerous wilderness where advanced civilization can develop and be sustained, protected from the wims of spirits and wild gods. Now instead of giving this power to immortal sorcerer kings, I want to adapt the idea from planescape that belief can change the environment. Not so much that reality fundamentally changes because people believe it, but to make it so that magic can have meaningful effects over large areas that will affect the environment in a wide range of ways. Usually an area is influenced by the gods of the land, but many priests, witches, and sorcerers working together can subtly change it through complex rituals and the construction of great magical monuments. These are the occult societies like the Sorcerer Lords, the Moon Knights, or the Fog Witches, and of course the Northern and Southern Churches. All their plotting and hunting for magical tomes is not just for knowledge or for power, but it’s a permanent struggle to preserve and strengthen the societies of their homelands, and there are always those who wish to change them to be closer to their own ideals. Ultimately, all the plots and fights are about protecting their way of life or creating a better world. It’s not the ulta-lowest common denominator of the entire existance of the world being threatened by a great evil that wants only to end all life. But it’s still as important a long-term motivation for the factions as it can get. The players’ involvement in their affairs will matter a great deal to large numbers of people. What is very important to me with this idea is to keep it all very subtle and mystical. The supernatural world is not a machine with dials to be turned and leavers to be switched. The goal is to weaken the influence of some spirit and to manipulate others. Magical constructions are not about building magitech devices, but about building temples from which priests project their divine powers, errecting shrines to claim spiritual ownership over a place, and to slowly enchant the waters of a lake to become a source of magical power that increases the strength of sorcerers near its shores. Another thing that seems appropriate to mention here, as it’s closely related and derives from these thoughts, is the subject of theme. A problem with my Sword & Sorcery setting was that I always had difficulties with making things feel meaningful and not just simple action fun. I really like Conan and Kane, but their philosophical concerns never felt like they could be applicable to a game of people playing together with limited time. They are much too brooding and inside looking. All my favorite stories that seem meaningful to me and where the problem requires direct action fall more into the Neo-Noir style. Stories that I find the most interesting are about failure and defeat, and comin to terms with the truth that in reality people are not heroe who can accomplish everything they want because they are determined. The most important questions are always how much you feel you need to accomplish and how much you are willing to give to accomplish it. And not the cliche of “I would give everything and will do anything it takes!” and then winning without actually having to pay anything for it. I also have a bit of a fascination with prophecies, but really don’t like it when it predetermines the outcome and removes all tension, or when the meaning can only be deciphered after it already happened. A nice solution I found for this is to have divinations only tell the characters whose paths they will cross if they stay on the path they are currently on, and whether this fated meeting will lead to valuable help or to a confrontation. It can predict when a decisive moment will happen, but not determine the specific outcome. Yoda tells Luke Skywalker that he will have to face Darth Vader, and he already knows this to be true. But neither of them can tell what will happen when he does. Now when you combine these two things with a setting in which powerful factions try to subtly alter the fate of whole region, a very strong theme emerges: Considering the consequences of your actions. Which is an important element in Noir. And which also happens to be a central theme in The Witcher. When you are a poweful warrior or sorcerer, your actions can have very large consequences. You can not simply charge into a place and destroy the evil and except that this nicely wraps everything up and will be happy ever after. This is what happens in a simple adventure story, but it’s not how things work in reality. Not ignoring the fact that sometimes things don’t go as planned and then having to find ways to deal with the consequences as best as they can is something that I feel adds a great deal of depth and meaning to a story. I found this and thought it looks like a fun idea. While my new setting has been taking a pretty clear shape now in my head, I’m not sure how well I’ve been able to communicate it so far. This list might help with that. The Witcher has clearly been the greatest influence on how things look and feel in the mundane world and the tone of how the various big actors are interacting with it. Dark Souls is perhaps the main inspiration for how characters will experience the magical world where things appear magnificent and horrifying and are barely understood or explained. Other important influences are Morrowind for the organization of society and the aesthetics for the Southlands (for which I am drawing on Byzantine visuals), Hellboy for it’s representation of spirits, Thief, and I am still chasing after recapturing the atmosphere of The Empire Strikes Back. Cities carved into the sides of mountains. A giant tree casting a whole glade in shadows while illuminating it with the glow of bright blue veins running through its bark. A ruined city of massive square towers rising from a swamp. Giant stone bridges with tunnels running inside them, large enough to hold entire towns. Giant volcanic spires rising high above a sea of trees with castles carved inside of them. A large stone castle, eternally on fire. 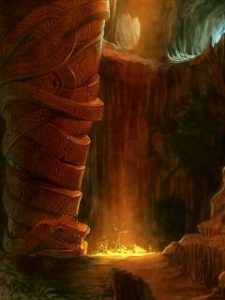 A cave large enough for dragons to soar in circles, with tunnels stretching deep into the mountains forever. Large stairs circling down into the Earth, with tunnels branching off to the sides and the bottom of the shaft hidden by dark water. A ruined city with vast underground tunnels filled with a poisonous mist that clears out every few years for a couple of weeks, the bones of men and beasts still undisturbed by scavengers. 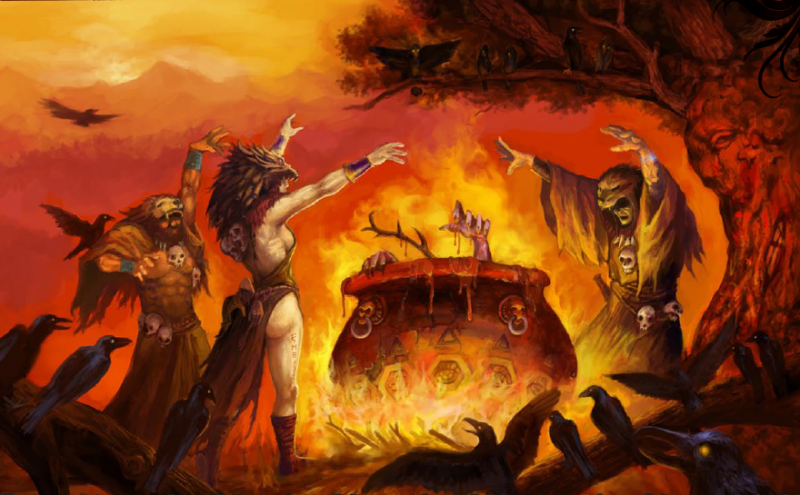 Witches who rule the barbarians of the barren and swampy lands of the fog covered north. Deceiving, treacherous, and pacifistic Priestesses of Life. Noble families of a southern city who all have many sorcerers among their highest ranks. A network of wealthy criminals who use bribery and assassination to break the power of the great merchant lord guild. Scale lamelar over mail hauberks for the fully armored warrior. War paint in bright blue, red, yellow, and black for those not fighting in heavy armor. Towns and whole forts made from solid wooden logs. Carved amulets of wood or bone or cast in silver or iron to be carried for protection against spirits. Stocky, short-antlered deer used as steeds. Long and sleek galleys and shooners with red and green sails racing across the southern sea. Camel-sized, herbivorous reptiles carrying heavy loads through the forests. Huge goats carrying packs and riders over the rough mountain passes. Thick, persisting mists that make wanderers endlessly walk in circles. Lands of Death that drain the life from all living things that stay for too long. Markers of sticks and bones on the border of the lands of some spirits and witches. Wooden poles carved with the faces of spirits to mark their holy places. Magic skulls of powerful sorcerers, witches, and spirits. Iron nails to ward against spirits. Powdered black petals of a southern flower that cause a painless dilirium. * These are all things taken directly or inspired by medieval culture of northeast Europe. Any good setting has some ongoing conflict that shape what is going on in the world and how people are responding to various situations and enncounters. More than anything else, this is what makes adventures feel different and not like they could be happening exactly the same way in any other generic setting as well. And in that case, what would be the point of making a new world? I have come up with three sources of conflict that are currently putting pressure on the people and are causing disruptions of the expected status quo. 200 years ago one of the Wood People cities was abandoned and fell into ruin, the remaining people of the realm resettling in the lands of other wood people cities or continuing a meager life in poverty by joining the Deer People clans that have been roaming the eastern lands for many generations. But eventually the Eldritch Wilds that had crushed the city spread to the hunting grounds of the Deer People as well, leading to many of the clans to go searching for new lands to live on. One large group migrated south and crossed the mountains of the Stone People into the lands of the Ash People, where many of them swore allegiance to the great cities to serve them as mercenary cavalry. Other groups took their herds west into the lands of the Woood People and Snow People. This inevitably put them into conflict with the local farmers and the lords of the cities are not happpy about the presence of foreign armies near their lands either. The Stone People are also weary about the increased presence of foreigners grazing their herds on the lower slopes of their mountains. 50 years ago, the Fire Mystics of the City of the Sun had a fierce power strugle with the sorcerers of their city and eventually turned to the Sorcerer Lords from the City of Sorcerers to recruit them as allies to crush their common rivals. The Sorcerer Lords were looking forward to destroying their rivals, looting their libraries, and absorbing the survivors into their own ranks, but when the conflict broke out into open violence the Fire Mystics went way overboard, causing the Sorcerer Lords to abandon their entire support of the power struggle. By the end of the year the City of the Sun was only burned out ruins and the Sorcerer Lords did end up absorbing most of the surviving sorcerers who brought many of their arcane secrets with them. The suvivors of the Fire Mystics went to the City of Flames where they continued to gather support from the local fire temples against the treacherous sorcerers. While the Fire Mystics are not in charge of the City of Flames, its relationship with the City of Sorcerers has been worsening for decades and both are constantly looking for opportunities to harm each other’s trade and alliances. The arrivial of the Deer People in the north put some considerable pressure on many of the outlying towns and large numbers of the poor farmers have packed up their things to seek better lives to the west. The Moon Knights, seeing themselves as protectors of the weak and the poor, saw it both as their duty and as a great opportunity to take charge of an organized settlement of the Northern Penniinsula, which so far had been almost entirely uninhabited. Almost. The Snow People to the east and the Ash People fishing colony on the Northern Islands are not very pleased about a new rival appearing in the region who is making attempts to get into their very profitable business of trading pelts and cod. But much more worrisome to them is that the Moon Knights are making a concentrated effort to push the Fog People north and stirring up the clans that have never been good neighbours even at the best of times. The Ash People fear a disruption of trade along the western coast, while the Snow People are seriously worried about an increase in raids by Fog People into their lands. The Moon Knights know very well that they are not welcome and that most powers in the region greatly wish to see their attempts to establish a new realm fail. Because of this they are seeking trade agreements and alliances with the Wood People in the east and the Ash People of the south. 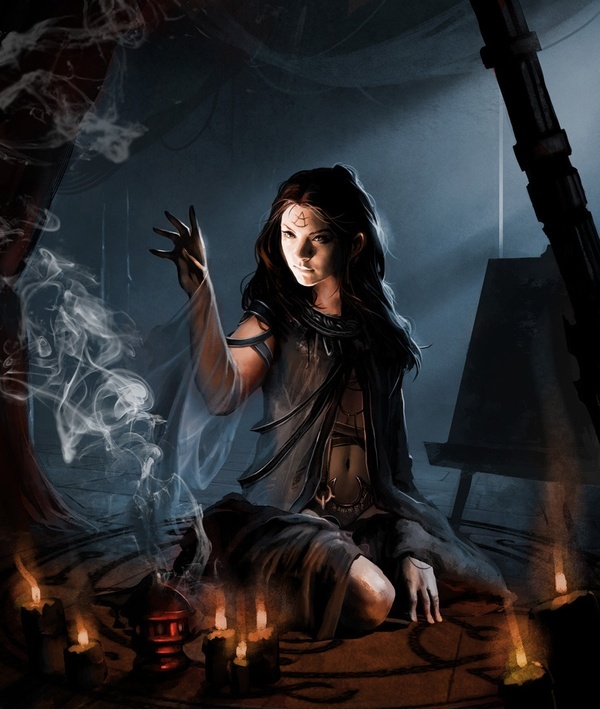 To many of the Snow People they are still seen as heroes protecting them from monsters and witches, but the highborn families see them as a major threat and have the support of most of the Moon Mystics. All the various mysic and occult orders are existing on top of this political environment. Many of them are deeply involved in the politics of the great cities, which adds a great degree of importance to their efforts to keep magical knowledge out of the hands of the other faction and claiming it for themselves.